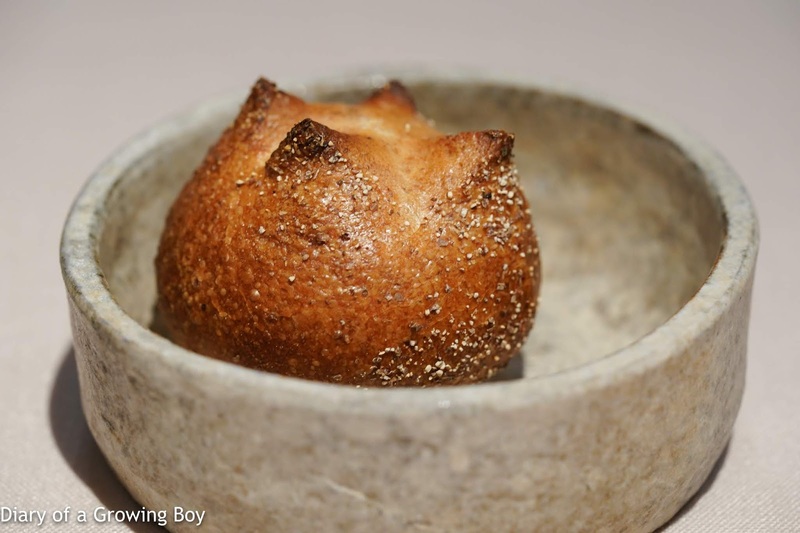 Ta Vie 旅 has been one of my favorite restaurants in town ever since my first visit, and over the years I have watched Sato-san further refine his cuisine. When he posted about his new dishes for the summer, I knew it was time to visit them again... so I rounded up a few people - including Chef DaRC (I have been requested to remove the world "chef" when referring to him, although the request didn't come from him...) - and took the opportunity to introduce this place to a friend. But first we got some of the homemade butter which I love so much. 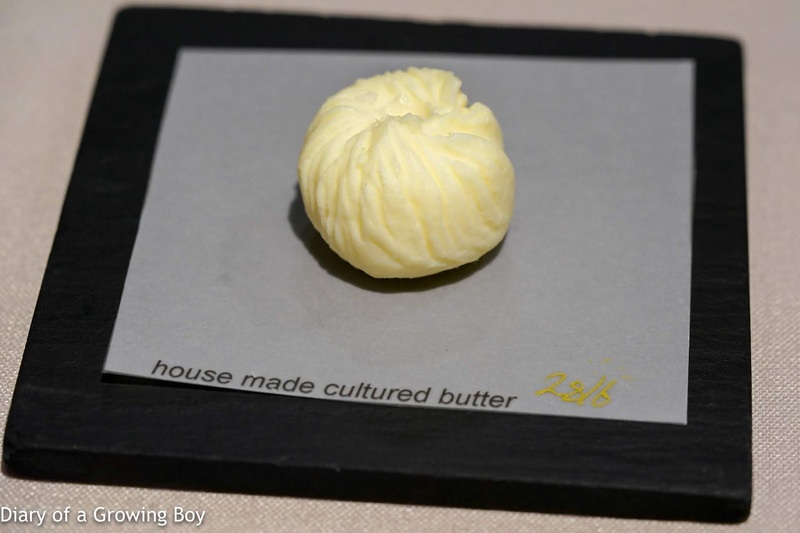 Yes, boys and girls... the restaurant makes its own butter in-house. And it's damn good. 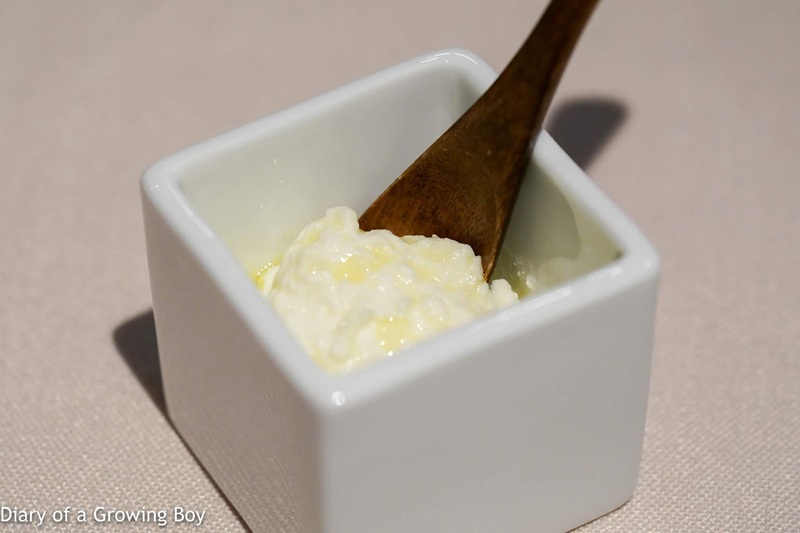 Takano-san also showed us their homemade ricotta... which was made with the whey from butter production. Served with a drizzle of olive oil. 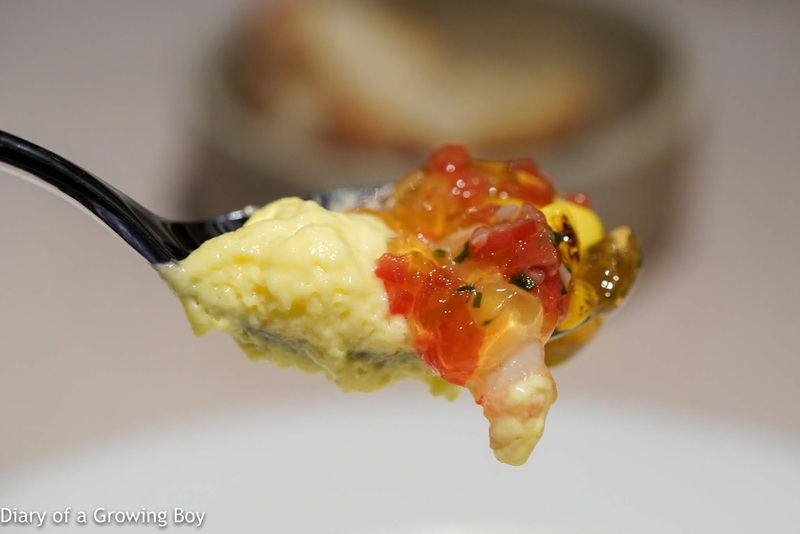 Sweet corn puffed mousse with aburi botan shrimp - YASSSSS!!!! I was so happy that this came back on the menu! This was arguably Sato-san's first classic dish after launching the restaurant, and I have never failed to love it. It looks like some gelée surrounded by a ring of corn mousse. Hidden within the light and ethereal mousse were kernels of crunchy, mostly-raw corn (from Hokkaido, perhaps?) which had been lightly charred. Together with the barely-torched botan shrimp (牡丹海老) from Hokkaido and the finely diced capsicum, these provided the sweet elements of the dish. Then we have the shrimp gelée on top for the umami, along with really fragrant olive oil for some savory notes. I did notice something new in the dish - some crunchy chips which didn't use to be among the mix. 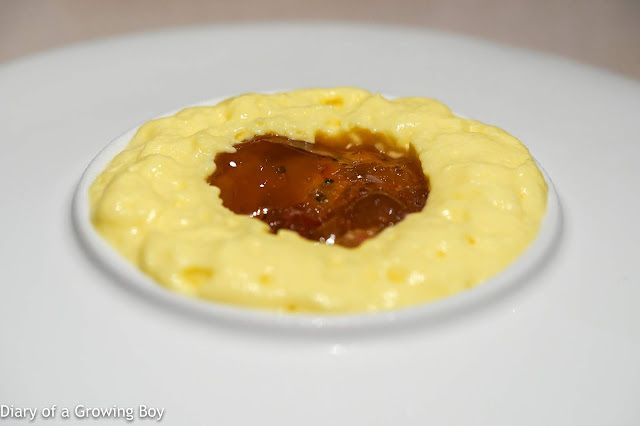 As it turns out this was deep-fried sheets made with tapioca and corn, and the result of a suggestion from a chef in Copenhagen who thought the dish could use a little more crunch. 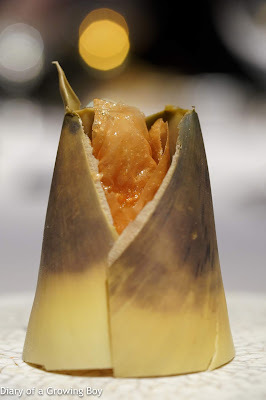 I actually thought the dish was perfect as it was before - since it already had a mix of crunch from the corn, additional texture from the capsicum, then raw shrimps with a little bite, followed by the soft and fluffy textures of the gelée and the mousse. But I didn't mind the additional crunch. Green asparagus with Burrata and Longjing tea leaves serves with avocado and green apple purée - this was something I had on my last visit a few months ago, and I still love it. 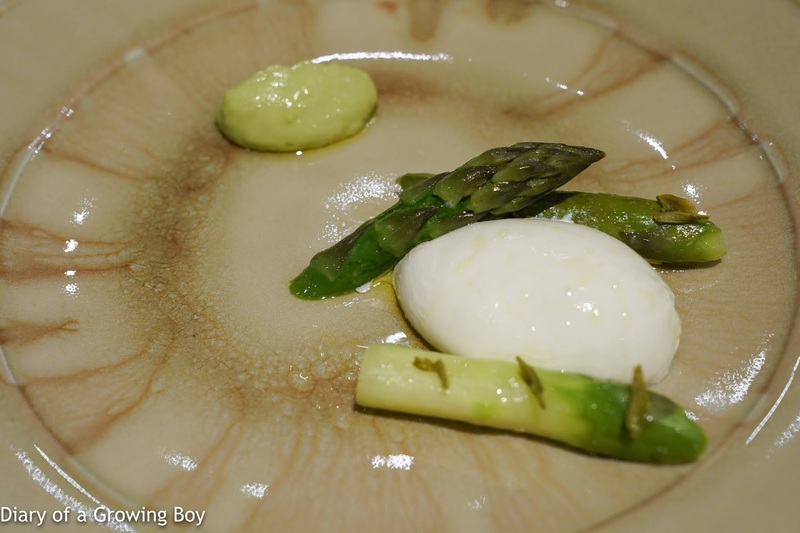 The Burrata was very, very good, and what's not to like about the asparagus from Hokkaido? While I'm not a big fan of plain avocado, the fact that it was puréed with green apples made it so much better with the added acidity and sweetness. 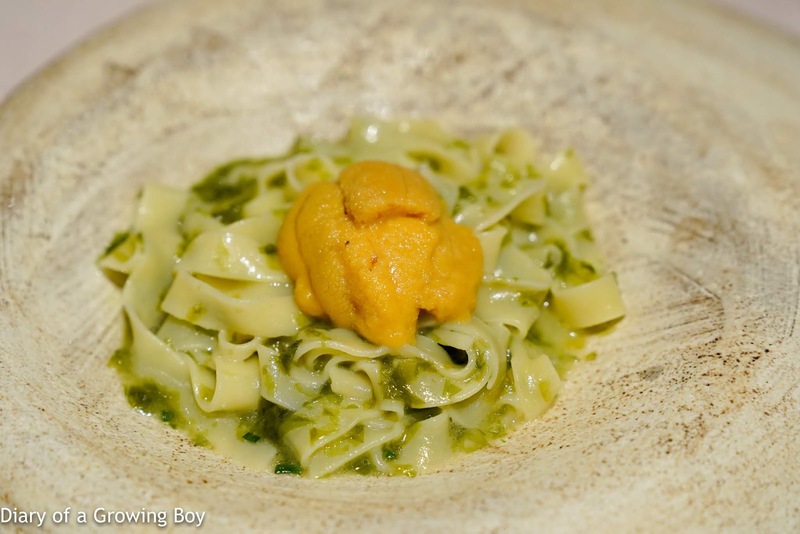 Housemade pasta with "aonori" seaweed sauce topped with "bafun" uni - thank you, Sato-san, for always including this dish when I come... I don't think it's possible for me to ever get tired of this. This combination with pasta dressed in aonori (青海苔) - which provides for plenty of satisfying umami - and the sweet and creamy sea urchin is just killer. Tonight Sato-san dispensed with his usual and served it with purple sea urchin (紫雲丹). Very grateful for the treat. Cold sweet onion potage with foie gras glazed with vintage balsamic - hidden underneath the cold potage made with Japanese onions and snow goose (雪雁) consommé was a piece of foie gras that had been seared, and for some reason it seemed particularly delicious tonight with the charring... or perhaps it was the 20-year-old balsamico with which it was seasoned. 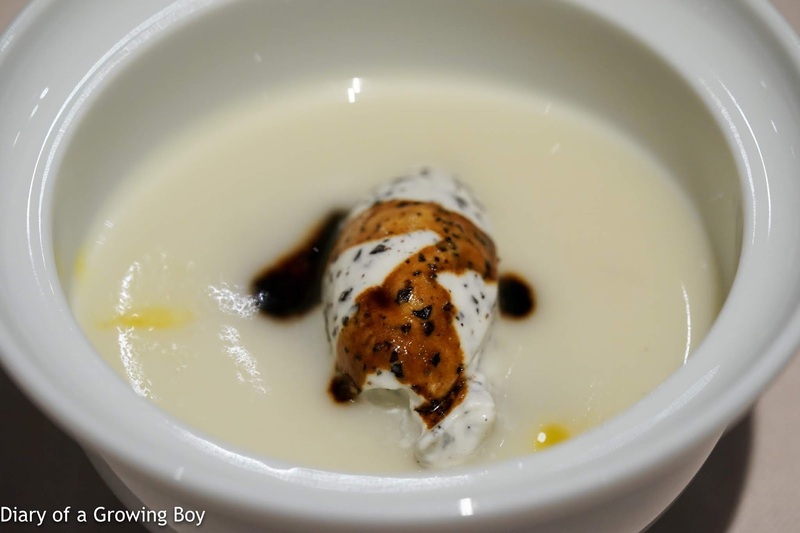 Oh and that little quenelle of chantilly made from Australian black truffles didn't hurt, either... SLURP! 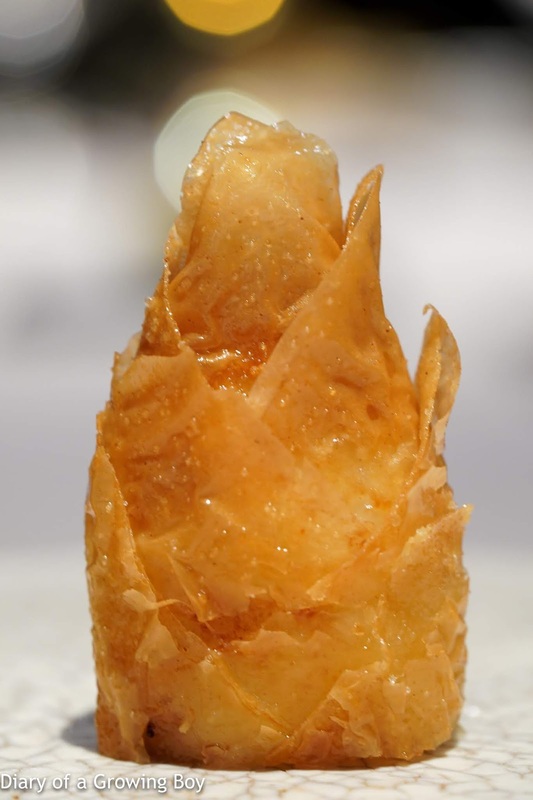 Deep fried Taiwanese bamboo shoot with crispy skin stuffed with Hokkaido scallop - we Taiwanese know that we've got some damn delicious bamboo shoots, and I'm glad that Sato-san agrees. 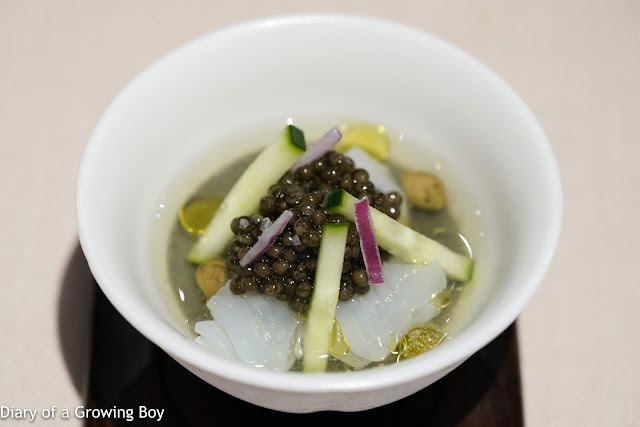 "Aori-ika" squid and caviar on black egg custard - the chilled squid ink custard with packing tons of acidity, with some bigfin reef squid (アオリイカ) on top, garnished with some Imperial caviar from Sologne by La Maison Nordique, capers, julienned cucumber, and red onions. 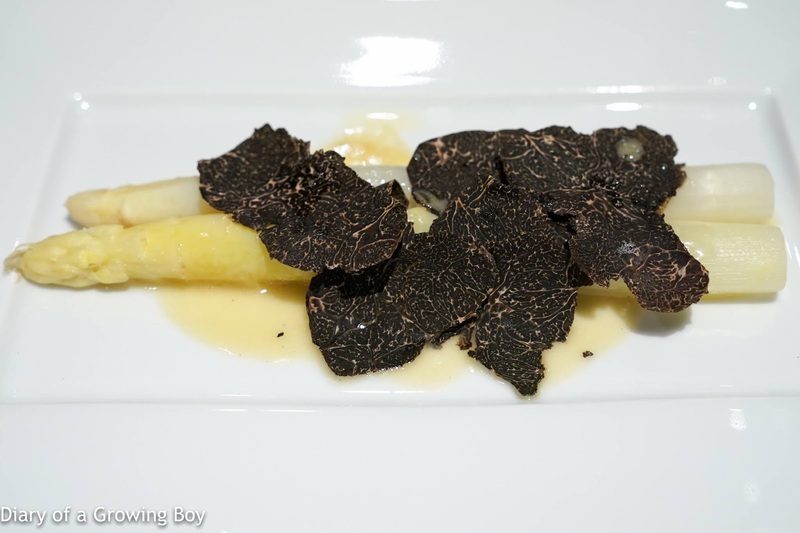 White asparagus with topped with black truffle - the poached white asparagus from Hokkaido came with a beurre blanc sauce and a generous amount of shaved Australian black truffle. Nice acidity there in the sauce. Very classic flavors. Charcoal grilled pigeon (medium rare) flavored with seasame oil, pigeon liver tapenade - the pigeon came with shishito peppers (獅子唐辛子) along with Inca potatoes alongside the delicious confit pigeon leg. 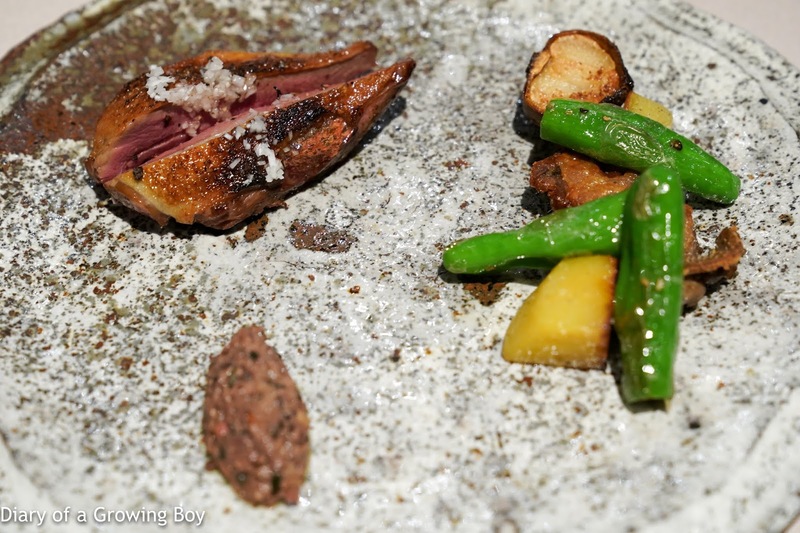 There was also a quenelle of tapenade made with the pigeon's liver. Slurp. 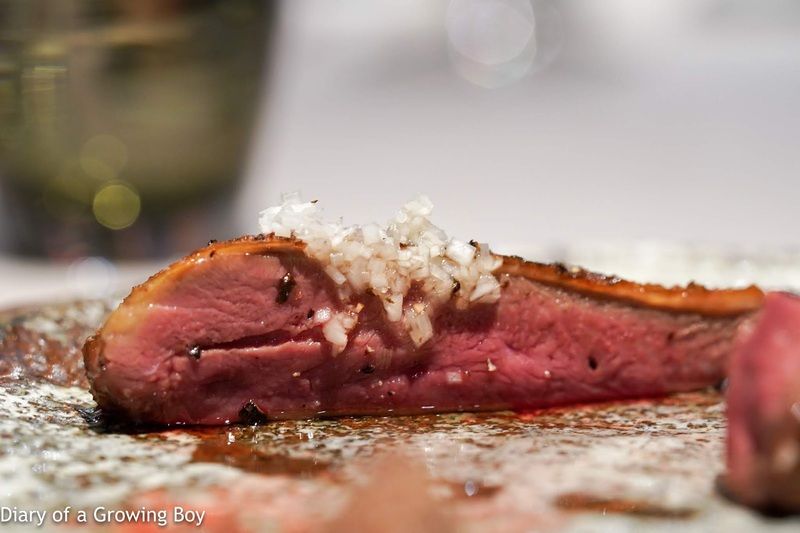 The breast of the pigeon certainly looked rosé, and came with smoked garlic. Tender and delicious as expected. 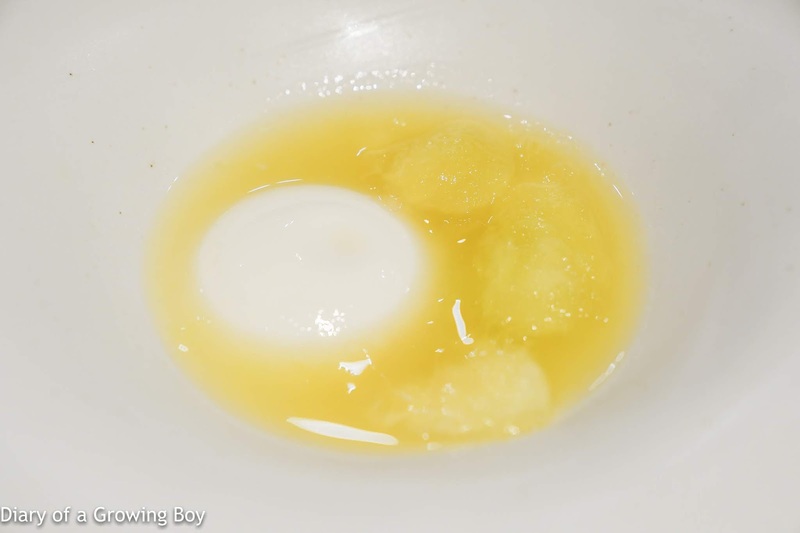 Jasmine flower and white tea blanc-manger with melon soup - I've always loved this for the Shizuoka musk melon (マスクメロン), which are so incredibly ripe and sweet. The blanc-manger had the lovely fragrance from jasmine along with some White Hair Silver Needle tea (白毫銀針). 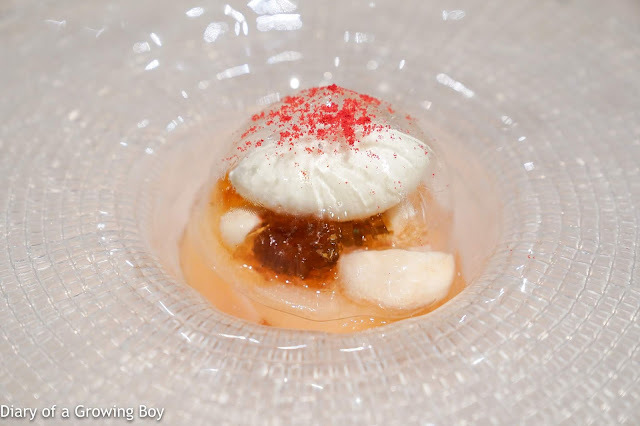 Peach compote, resin crystal, mangosteen, coconuts - underneath the very thin candy dome sat some delicious peach compote, along with some cloves of fresh mangosteen, springy peach resin (桃膠), and a quenelle of coconut sorbet. Delicious and refreshing. Normally I would be getting the delicious herbal tea, but as DaRC had just invited me to join him in watching the England - Belgium match showing live at 2 am, I figured I needed the caffeine. 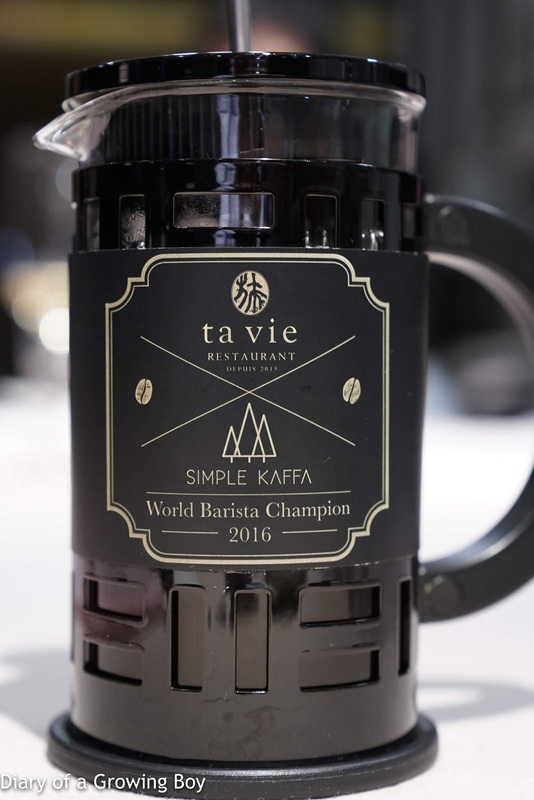 This Tano Batak Mandheling was actually roasted by a former world barista champion from Taiwan. 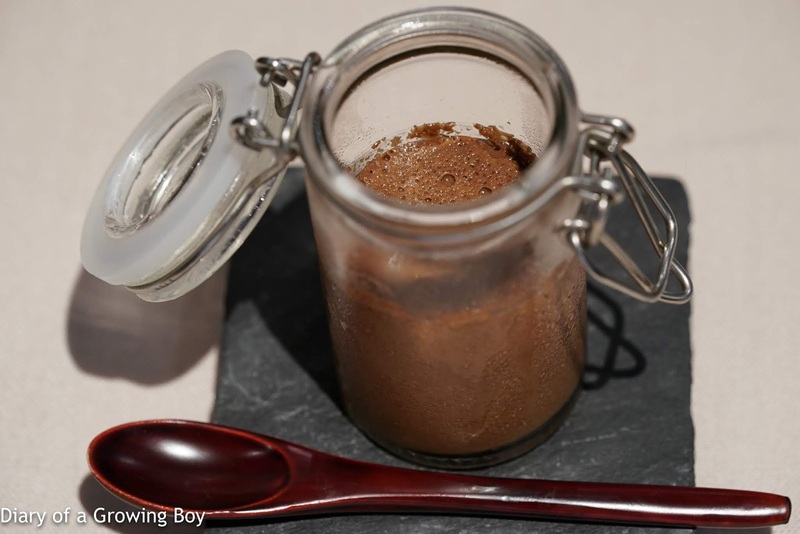 Chocolate mousse with kaffir lime leaves - the benefit of ordering coffee is that I get to have this delicious chocolate mousse. I always love this for the kaffir lime fragrance. 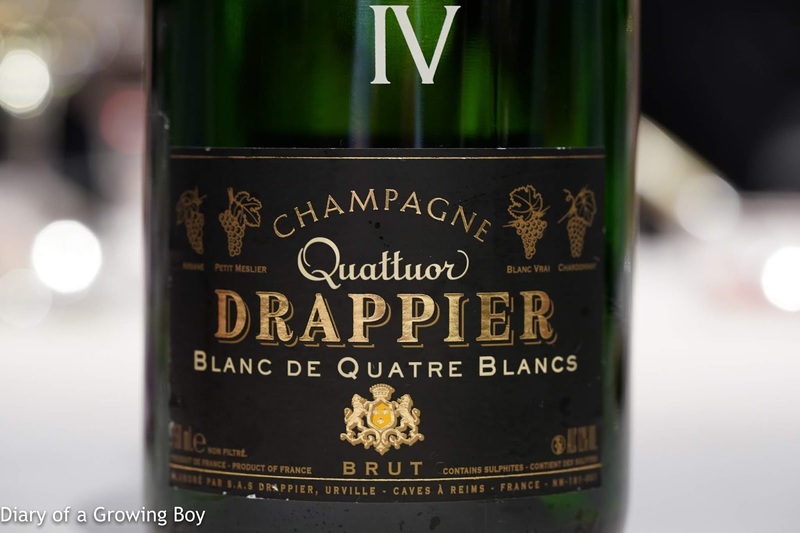 Drappier Quattor - nice body and good depth with acidity a little on the high side. Lovely floral nose. 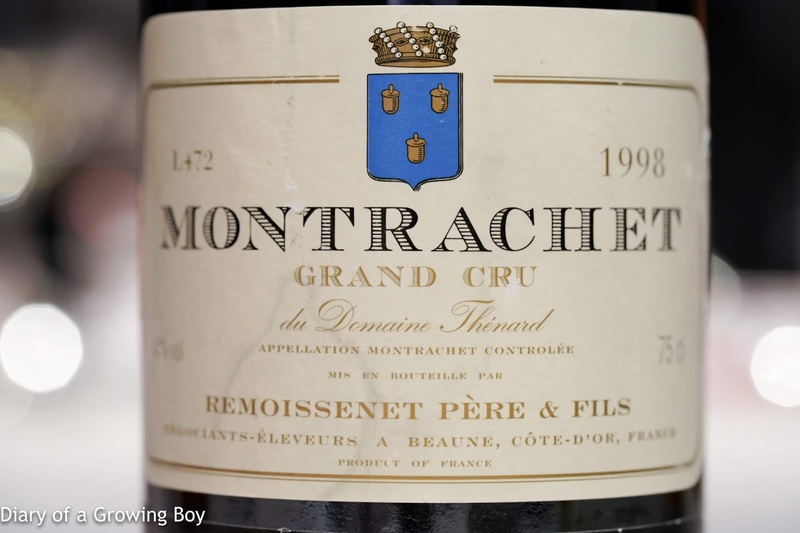 1998 Remoissenet Montrachet - lovely nose, with toasty notes which did not seem overpowering. Nice and aged marmalade notes, almost floral, caramelized and kind of sweet on the nose. 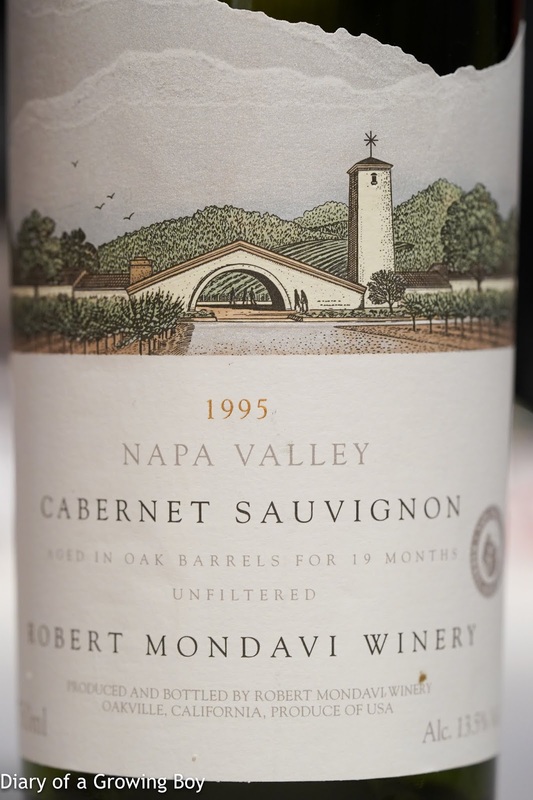 1995 Mondavi Cabernet Sauvignon Barrel Reserve - minty, earthy, smoky. Nice and ripe fruit, with a hint of acidity on the finish, although tannins were still here. Another very happy dinner here... and glad to have tasted the new creations along with some classics!